TAFRO syndrome represents a characteristic constellation of symptoms comprising Thrombocytopenia, Anasarca, myeloFibrosis, Renal dysfunction, and Organomegaly, and is considered to be a clinicopathologic variant of idiopathic multicentric Castleman disease. A 51-year-old woman was admitted to the hospital complaining of abdominal distension. Findings on physical examination were indicative of anasarca. Computed tomography revealed mild splenomegaly, pericardial effusion, pleural effusion, ascites, and paraaortic lymphadenopathy. Blood tests showed thrombocytopenia, and urinalysis demonstrated hematuria, proteinuria, and worsening renal function. Kidney biopsy was performed and revealed thrombotic microangiopathy-like lesions with global sclerosis of 1 of the 16 glomeruli on light microscopy. The remaining glomeruli had a distinct lobular pattern, with mesangiolysis, double contours of the glomerular basement membranes, and marked endothelial swelling. Immunofluorescence studies for IgG, IgM, IgA, C1q, C3, C4, κ-light chains, and λ-light chains were indeterminate. Electron microscopy showed marked endothelial swelling. We made a diagnosis of TAFRO syndrome and started steroid treatment, following which her symptoms gradually improved. 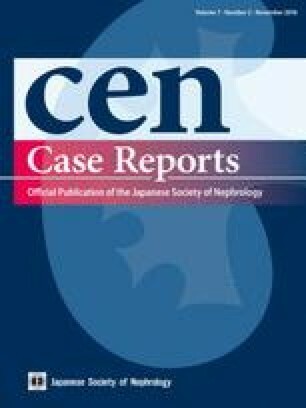 There are few reports describing renal pathology in a patient with TAFRO syndrome. Informed consent was obtained from the patient in the case report.